Thanks to San Diego Comic-Con 2018, the hype surrounding Dragon Ball Super's first movie, Dragon Ball Super: Broly has reached a fever pitch. While the first Dragon Ball Super: Broly trailer was the crown jewel revealed during SDCC, some additional character images revealed during the Dragon Ball Super panel have revealed a franchise first: Super Saiyan God Vegeta! 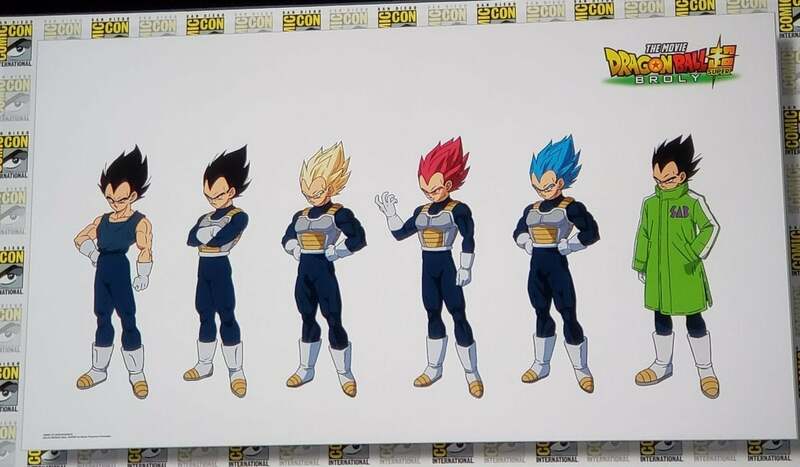 As you can see in the character designs above, Vegeta is going to get his first Super Saiyan God anime transformation in Dragon Ball Super: Broly. With that reveal, fan discussion has immediately turned toward the obvious follow-up question: why now? Super Saiyan God made its debut in Dragon Ball Super's first arc, "Battle of Gods," when Goku unlocked the transformation in order to keep pace in his fight with Lord Beerus. Goku never enjoyed the ki transfer ritual needed to first access SSG using six righteous Saiyans - but it grows on him once he learns to access it at will, through his Super Saiyan form. However, Dragon Ball Super ultimately made SSG the LaserDisc of Saiyan transformations, as the Golden Freeza saga came along and made that transformation largely obsolete with the debut of Super Saiyan Blue. In manga, Vegeta actually reveals a SSG form, but just as an aside, when he debuts the transformation in front of Goku Black and Future Zamasu during the "Future Trunks Saga." Goku and Vegeta demonstrate their divine power for the evil kais, showing them how they can change from SSG to SSB purely by will. Returning to the question of why SSG is making a return for Dragon Ball Super: Broly: one has to wonder if the form doesn't have some kind of important connection to the film's storyline, which is already teasing some big new revelations about the Saiyan race. It doesn't seem plausible that SSG would be needed for power since SSB is more powerful - but in trying to reach Broly, or "fix" him in some way, it may take Vegeta, Goku, (and others?) using the ancient Saiyan power to achieve that end. What did you think of your first full look at the Dragon Ball Super movie? Let us know in the comments! Dragon Ball Super: Broly comes to theaters in Japan on Dec. 14, 2018. It is expected to reach the United States in mid-January 2019.